2018 Regional Registration is now open! Unlike the Area Qualifiers, to confirm your guaranteed spot or Alternate status at the Regional Championship, riders must pre-register with MX Sports by the deadlines below. The pre-registration processing fee for each class is $50 and is separate from the gate admission and race entry fee the track will require. 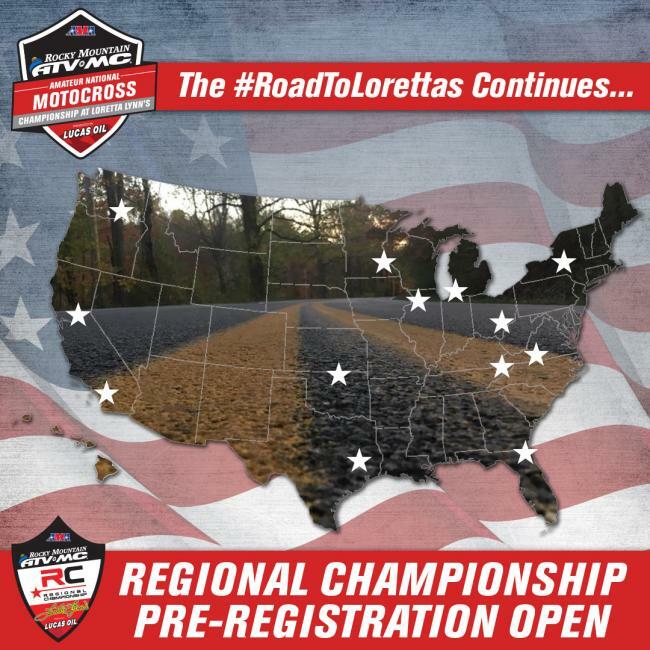 If a rider does not pre-register, including riders with guaranteed positions, it will be assumed the rider is not attending the Regional Championship and the position will be filled with an Alternate. Riders have two options to pre-register: online or by mail. Regardless of the option chosen, the deadline to receive entries must be met by all riders - guaranteed or Alternate. Online Registration is now open, and will be open until Monday 12:00 pm EST prior to each regional. If registering online, DO NOT mail in the paper form. CREDIT CARD, CASHIERS CHECK OR MONEY ORDERS ONLY! PLEASE NO CHECKS!